As a spa owner it is nearly inevitable that at some point you will encounter cloudy water. Whenever your water appears milky, murky, gray, hazy or dull this would be considered cloudy water. There is not one thing in particular that can be blamed for cloudy water but commonly it is caused by things such as unbalanced chemicals, poor filtration, or particles too small to be captured by the filter. If you are experiencing cloudy water the first course of action is to test your water and ensure that you have proper sanitizer levels and that pH, alkalinity, and calcium hardness are within the proper ranges. Having unbalanced water could be causing the problem. After testing your water, if everything is in balance as it should be the next thing to do to combat the cloudy water would be to ensure that your filter is clean and not clogged. Filters should be removed and cleaned every 4-6 weeks. This can be done by removing the filter, spraying it off with a garden hose and then using Spa Pure Filter Cleaner, allowing the filter to soak overnight in it will degrease the filter and remove build up. Ensuring that water can move freely through the filter and it is not clogged, allowing it to trap contaminants as it should. There are instances where particles in the tub can be may be too small to be captured by the filter and they can cause cloudy water. Using a clarifier like Spa Pure Clarifier or Natural Clear will bond the particles together allowing them to be caught by the filter. 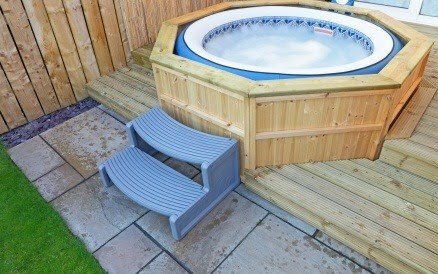 At Hot Tub Warehouse, we recommend adding clarifier once a week during regular water maintenance to keep your water sparkling and clear all the time.